The first working day has begun at the new Welsh assembly building - the Senedd - in Cardiff Bay. The £67m building, designed by Richard Rogers, will host its first debates in the afternoon, including first minister's questions. A ceremony to officially open it will take place on St David's Day, 1 March. Cancer patient Jayne Sullivan, who is staging a sit-in protest over the availability of the drug Herceptin, will move to the new building. Finance Minister Sue Essex, who's been responsible for the project, had held the first government briefing for journalists in the new building. "This is not like any other government building I've ever seen," she said. "This is not forbidding. Hopefully it's a friendly building." 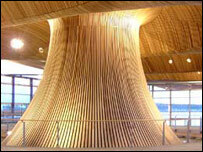 She said she was pleased that people outside of Wales have been recognising the building's quality. "There's been a lot of debate around the cost of the building and that's fair but we've kept it very tight over the last few years," she added. The Senedd - parliament or senate in Welsh - has been completed eight years after it was first announced that a landmark building would be constructed on Cardiff's waterfront to house Wales' devolved administration. The total cost of around £67m - which includes spending on information technology, broadcasting equipment and furnishings - is more than five times that originally predicted. 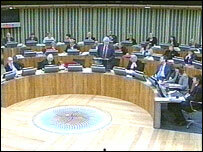 Building work was also stopped for two years because of a dispute between the Welsh Assembly Government and Lord Rogers. 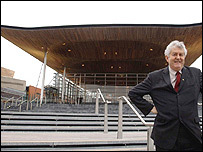 The first working day at the building will include questions to First Minister Rhodri Morgan and a debate on the process of approving new drugs, including Herceptin. The new building has won praise for its construction on "green" principles using energy-saving and recycling features. Its renewable energy systems aim to reduce running costs by up to half. Other features include using the ground as a heat source and the use of wood chips or pellets for the boiler. Rainwater is also collected via the steel columns supporting the roof to supply the toilets and to wash the windows. Lord Rogers said energy conservation was a central principle in the design of his building as well as creating a space where politicians and members of the public could meet. He added: "We certainly wanted to make a statement about the importance of energy and the careful conservation of energy. "The idea was that steps rise out of the water and there is a whole public domain where people meet each other and look down on the assembly members." Lord Rogers said he hoped the new building would prove inspirational to a new generation of politicians. He said: "The idea would be that a child who comes into the place is inspired by the place and decides to become an assembly member." Jayne Sullivan has stayed in the current assembly building next door for six days in an attempt to make the drug Herceptin more widely available for breast cancer sufferers in Wales. The 45-year-old mother plans to walk the short distance from the old to the new assembly building and resume her demonstration.